I love filming with my iPhone 6S. It’s a great little camera. It’s small, so I can have it with me all the time and put it in unusual positions. It’s unobtrusive, so people don’t pay much attention to it. And in good light, the images are really sharp and the colours are excellent. But it’s not perfect: it’s not good in low light or with very contrasty subjects, it’s hard to hold steady, and the built-in microphone isn’t great, especially outdoors. So here are some workarounds and solutions. Find somewhere quiet to film. Point your device or microphone away from where the sound’s coming from. Forget live sound, and create the soundtrack later with a voiceover, music and sound effects. Plug in a directional microphone, a lavalier microphone or even a professional wireless mic (using a TRS-TRRS adapter). You can fit furry wind shields to any of these. 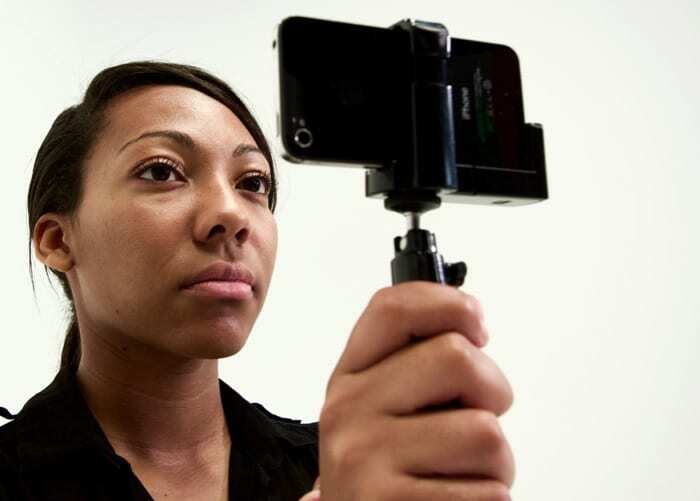 Plug a lav mic into a spare iPhone in the actor/presenter’s pocket, and sync the sound later. Make the most of natural light: shoot away from the light and use a reflector to fill in shadows. In very low light, use a selfie ringlight an iBlazr plug-in light, or an Aputure AL-M9 LED. If it suits your subject – say a nighttime cityscape – use FiLMiC Pro to shoot a time-lapse. Set the frame rate to the minimum (3 frames a second) and slow the shutter speed until the exposure looks right. Use your finger to block light falling on the lens. If you’re using a case with a thread for screw-on lenses, use it to fit a lens hood. Get the skin tones right, they’re the most important. Film away from the light. Use portable folding reflectors to fill in the shadows. Use a sheet of white paper or card or a white wall as a reflector. Lean your arms on a table, lean against a wall, or rest the iPhone/iPad itself on something. Rest your upper arms against your body. Use a camera clamp or case with a handle. Put your device on a tripod. Use an electronic gimbal stabiliser like the Osmo Mobile or Zhiyun Smooth Q. If it suits your subject, you could shoot in slow motion (to make camera shake less obvious) or even use a still instead. Make sure your iPhone is charged before you start. To maximise your battery life, avoid charging it to 100% or letting it drain completely. Use AirPlane mode to save power if you don’t need connectivity. Take an external battery pack with you. Don’t film in 4K or at a high frame rate if you don’t need to. Make space by deleting any apps, photos, video or music that you definitely don’t need. You can always reinstall apps later. Take another iPhone or iPad on location with you and AirDrop your files to it, so you can delete the originals and free up space. Use a plug-in Lightning/USB storage module such as the SanDisk iXpand. Get close to the subject and make sure it’s well away from the background. Use a telephoto lens adapter. Use a depth of field converter to mount DSLR lenses. Turn off video stabilisation (in alternative camera apps such as FiLMiC Pro) to get the full wide-angle image. If your iPhone can shoot 4K but your finished film will be in 1080p or 720p, you could shoot in 4K and zoom the image when you edit. Use wide-angle or telephoto converter lenses. Shoot stills instead if it suits your subject. Stills use the full wide-angle image, and they’re higher resolution so they stand up better to cropping. You can use the Ken Burns effect when you edit to apply subtle movement to them.